the launch of AYA Fashion and now due to demand we are pleased to launch AYA OPTICAL. AYA - What does it mean? The beauty of First Nations art, fluid and graceful. The beauty of the product - subtly elegant. The beauty of our land and animals, fragile yet surviving. Every pair of AYA Optical eyewear is complimented with an AYA embossed case, cleaning cloth & box. All AYA Eyewear is warrantied for 12 months from date of purchase. Monthly PR initiatives, advertising, displays, counter cards, bags and boxes. 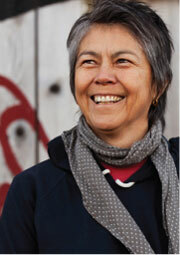 World renowned First Nations artist Corrine Hunt was commissioned for the first series of AYA Optical. Corrine, co-designer of the 2010 Olympic medals, has been creating contemporary art that reflects the themes and traditions of her First Nations Kwakiutl and Tlingit heritage for more than 25 years. Breakfast Program. ONEXONE is a non-profit foundation commited to supporting, preserving & improving the lives of children around the world.